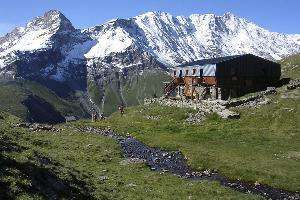 Mountain hut belonging to the French Alpin Club, 2373m altitude. Open during the spring only on reservation. 2h30 walk from Les Lanches and 1h30 from the summit of the Transarc. 4 dormitories. 1 has 20 sleeps, 2 others have 15 sleeps and 1 has 5 places (for the guides) : all together 55 sleeps. On the way to the "Mont-Pourri tour"
Near the south side of "La Brèche Poccard" (5 rock climbing paths, all equiped from 5c to 6a+ levels). Near the Regau hut, with the exhibition of the Alpinism History in Peisey-Nancroix valley. Diner (soup, hot meal, cheese, dessert) at 7:00 p.m.
À la carte during the day: drinks, wines, omelets, salads, cheese, plates of charcuterie, fresh cheese, chocolate cake, blueberry tart, apple pie, etc. 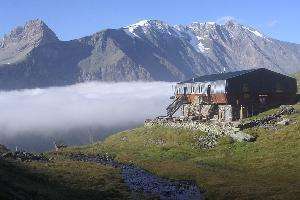 Website "Mont Pourri mountain hut"